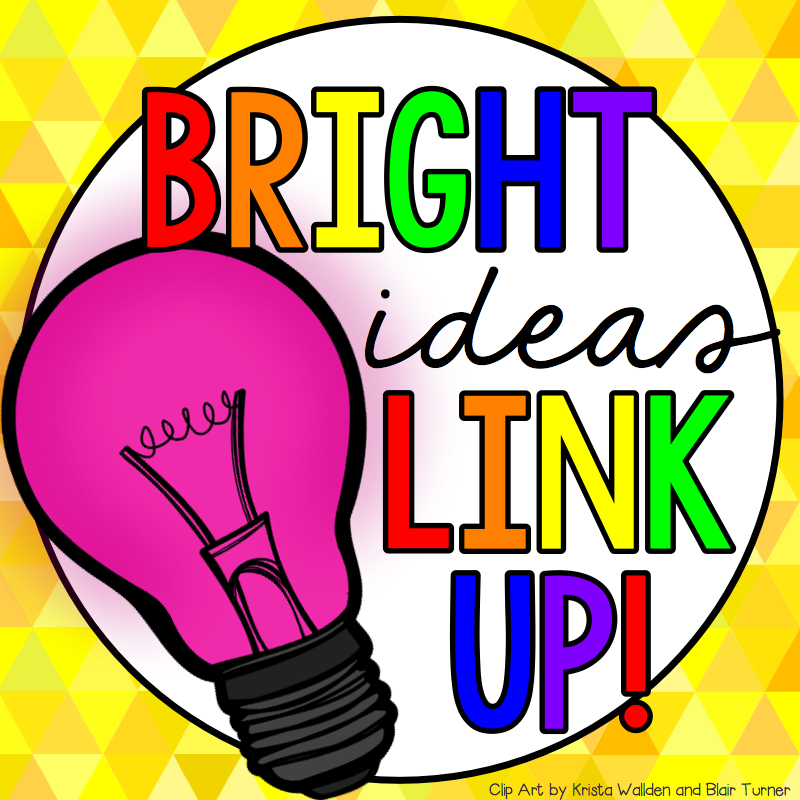 Are you ready for another bright idea? We all use anchor charts to introduce concepts in class, and leave them up through the teaching as a reference for students. I still use anchor charts that way, but I've also started to use them to summarize the learning we've done through a unit. My Summary of Learning anchor charts are cumulative and student led. 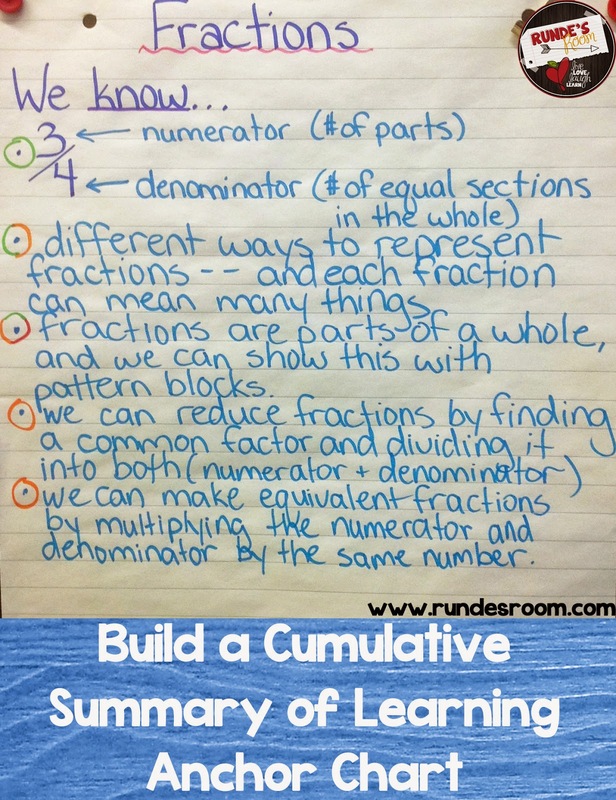 The title of the anchor chart is our overall unit (this one was for fractions). After each lesson, we summarize our learning into one main point or idea. The students take a minute or two to discuss this with their partner before they offer suggestions to the class. (A great way to tie in summarizing and main idea - integrating our Language Arts learning into math). When we have agreed on the main idea and how we are going to word it, I write the one point on the chart. You can see the colored circles around each point. We call these our "Comprehension Dots". Green means, "I've got it! ", yellow (or orange) means "I'm getting it - I just need a little more practice", and red means "I found that difficult. Can we try that again?" After we write our point on the anchor chart, I ask the class about our comprehension of the concept. I ask them, "Who thinks today was a green?" They raise their hands if they agree. We go through all the options, and then color code our dot according to what the majority of the class thought. Sometimes, if there was an even split between two colors, we include both colors. Adding the comprehension dots is a great way for the teacher to quickly see how the students felt about a particular concept, and whether or not it needs to be reviewed again before moving on. If only a few students felt the concept was difficult, they can be pulled during the next class to review the concept. We keep this Summary of Learning Anchor Chart up during the whole unit, adding to it after every class. When the unit is over, the Anchor Chart makes the perfect starting point for review before a summative test or assignment. Although it only takes a few minutes, it has become a such a valuable tool in the classroom. This is a brilliant idea...and I love the comprehension dots! Definitely going to use this idea at the start of the year! Thanks! Posting on Pinterest to remember too! When I looked at the "bullet points" I thought you just had the same trouble I've had in class - a marker running dry. LOL After reading the description, how amazing is that? I'm wondering if you combine that comprehension check with another strategy, or maybe just leave this until a little later in the school year, when you know your kids are comfortable answering frankly?